Are you finding it harder and harder to control your weight the more years you live? Have you discovered that—despite all your efforts to the contrary—your belt cinches tighter and your sizes have gotten (or threaten to get) bigger, leaving you feeling frustrated and out of control? Or maybe you are simply finding it impossible to budge that last nagging bit of poundage. In spite of everything we know about the down side of going up in weight, research tells us that between the ages of twenty and fifty the typical adult in westernized countries such as the U. S. gains about twenty-five pounds between the ages of twenty and fifty. This trend toward gain only continues as the years advance into our fifties, sixties, and beyond. But then again, this may come as no surprise to you. Perhaps it is your own personal experience. There is no reason to resign yourself to creeping weight gain, no matter how many times you may have failed in the past to get some degree of mastery over a spiraling poundage problem. That is The Plant-Based Journey promise – increased mastery over your health, your weight, and your frame of mind about it all. You’ll find it deeply woven into my personal experience: profiled on the About Page, in Chapter Two of The Plant-Based Journey book, “My Plant-Based Journey”, and indelibly threaded through this site. At 63, I currently weigh less than I did in high school. I am over fifty pounds lighter than I was nearly twenty years ago. I’ve maintained that weight loss as I’ve moved through my late fifties and into my early sixties. Actually, I’ve trimmed even more in the last ten years – the exact time when we are all, statistically speaking, supposed to be packing the on the pounds. In this Special Report, I’ll give you some of the tools I use that make difference—despite my genetic predisposition to putting on weight easily and a thirty-year battle of struggling to control my weight before realizing the success I so desperately sought. An important part, for sure. But it’s not the whole story. There are other influences that come into play here. After all, I make a point of underscoring at every opportunity this triple play: plant-based, active, mindful living – the three pillars of success. The four steps I describe in this Special Report give you a perfect example of leveraging mindfulness for success. Easy to learn, and simple to implement, these steps will advance your healthy weight goal. As a special thank you for your enthusiastic support of the journey of The Plant-Based Journey – from conception to over two years of research, writing, and development – I’ve put this report together for you. 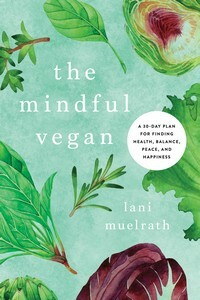 Within these ten pages, you’ll also find the four steps that are modeled throughout The Plant-Based Journey. You’ll find the report request form further down the page, right beneath “Share the love”. Be sure to click on the confirmation link in the email you will be sent immediately upon signup – a critical step to getting this document into your hands. And be sure to post here and tell me how you like the report, OK?! Are you finding it harder and harder to control your weight the more years lived? Or maybe you are simply finding it impossible to budge that last nagging bit of poundage. You’re not alone and this report can help! Thanks for requesting my Special Report! Complete your request by clicking on the confirmation link in the email on its journey to you now. Yay, it’s here! I just downloaded your new report and wanted to thank you before I got started on it. It looks beautiful! How do you always seem to know what I need next? Lisa, well, isn’t that just perfect? Love good timing. Thanks for your post! Right above in the post is a form that says ‘sign up to receive my report”. Simply fill in your email, send, and you’ll receive info in your email box. Anna, I just added your email to the mailing list for the report. You should be receiving something soon. I can’t find the link either. Does it only function as a hyperlink from a desktop computer (not on a mobile device)? Thanks! Hi Rebecca! I submitted your email to the signup so the report email should be on its way to you. So sorry for any inconvenience! The other forms on my site have been created in the same fashion and have all tested mobile-friendly, so I don’t know what the problem is. At any rate, thank you for letting me know so that I could troubleshoot. Let me know if you get the report materials! Hi Chris! Sorry about that, I have the tech team working on it! And I went ahead and signed your email to the list for the report, so you should get a confirm email pronto. let me know! Hi Lani, I just read the report and it’s given me some great ideas and inspiration. I always appreciate the way you tell about examples from your own personal experience, it helps emphasize things. 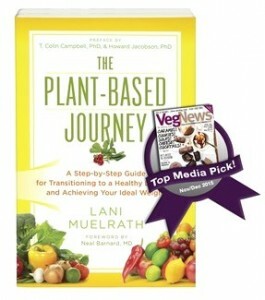 I’m excited to see the steps are in The Plant-Based Journey book, too. Perfect! Can’t wait for the book to come out. Hi Karen, thanks for taking a peek right away! I am so excited that you like the report and are looking forward to the book! to learn, try and enjoy. Monica, it means a lot to me that you stopped by to share your thoughts. Thank you! Can’t wait to hear how you like the Report! Lani, I just read your report and will print it out to review frequently. I can’t wait for your new book to arrive. September seems like forever. Donnella, sounds like a positive review?! I’d love to hear more about which points hit home most for you. September will be here before you know it! And from my experience, pre-orders alway arrive in advance of release date, fingers crossed! I can’t find the link to your generous ‘Four Simple Steps’. As someone who has benefitted from ‘Fit Quickies’ and is eagerly awaiting ‘The Plant-based Journey’, I would love to read this great-sounding report. May I say you are a fabulous advertisement for the success of your approach! Right above in the post itself is a green form that says ‘sign up to receive my report”. Do you see it? Simple fill in your email, send, and you’ll receive info in your email box. I can’t see how to download it either! . I can’t see a green form or the text “sign up to receive my report”. Is it only visible on desktop, not phone perhaps? Deb, so sorry for any problems with the form – I responded to your questions on facebook and installed another form page too BUT no worries, I took the privilege of signing you up (hope that’s ok!) so you should have an email regarding same. Let me know! 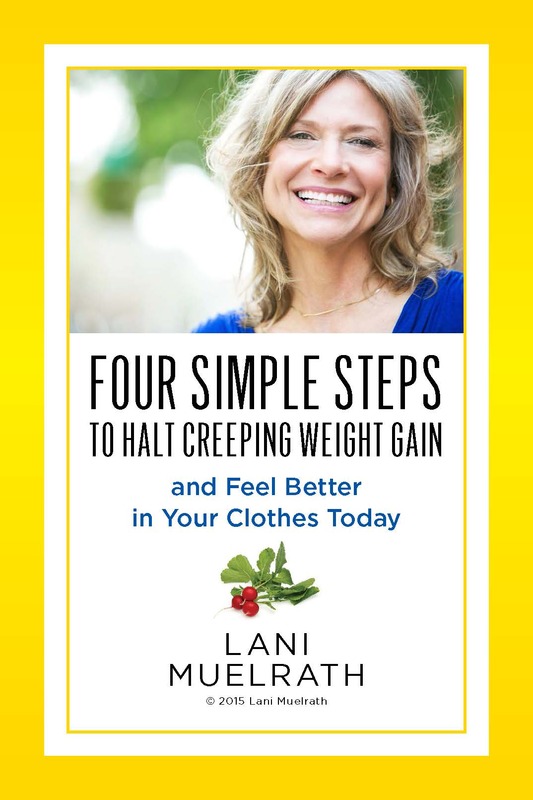 Lani, This free gift is just like you – a generous gift to all of us who struggle with food and weight issues! thank you so much! TD, thank you so much for taking the time to leave such kind comments. I am looking forward to your thoughts on the report! Lani, The report is spot-on! While reading it, I identified 3 things I am doing similar to your cookie experience. Now I am in the process of identifying the micro changes I need to make and dealing with the resistance to those changes. I love the idea you present that small changes make big results. That makes it feel do-able. Thanks again for sharing this report for those of us with tight finances. It was generous of you! As a very new subscriber (still need to buy book! ), what about designing a very cool and elegant/premium women’s tee-shirt that is slimming AND advertises “Plant Based Journey” on the front or back? I’m visiting your site after listening to your lecture for the Plant-Based Transformation Summit. Great interview! I tried to request the “Four Steps . . .” report after requesting “Plant-Based Journey” preview. I haven’t received the e-mail for the “Four Steps” after an hour or so, although I received the “Plant-Based Journey” response immediately. Could you help? I have it now. Thank you! Oh good! I had just researched the records and saw that it had been sent, came here to tell you so, and I see your response. Did you find it in your regular email, or had it somehow been diverted to spam? At any rate, glad you got it! 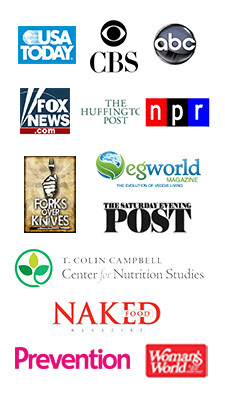 I am so happy to hear you enjoyed the interview on the Plant-Based Transformation Summit! Thanks for letting me know, and I look forward to hearing from you about how you like the gift downloads. The link is not letting me enter my information so i can get this report [4 steps to halt the weight gain ] Is there any other way to get this?? Love your information!! Thanks for your note. I just entered your name and the email you submitted with your reply here and it responded as designed, so I am not sure what the problem was! Perhaps your browser? At any rate, no worries as the email with confirmation link is on the way to you know. Simply click on the link in the email and you will be sent the report. 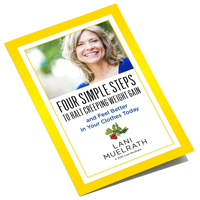 If you don’t see it soon (the confirm email) then check your spam box, or search for anything from admin@lanimuelrath.com in your email. Keep me posted and let me know when all comes through! Can I still get the report, 4 steps to halt the weight gain? Yes! And thank you for bringing to my attention the fact that the download form for the report had vanished! It has now been restored, so please let me know if you have any trouble finding it. Enjoy the report! I signed up but never got the report. I checked the records and they indicate that your request came in today (July 1) at 12:54 a.m. – and that the confirmation email had been sent. But it is still waiting for confirmation from you! That means you need to go into that email and click on the confirmation link, at which point you will be sent the link to the report. It’s possible that it has gone into a spam box – search your email for anything from admin@lanimuelrath.com and that should do it. Let me know and thanks! I will also send this message to your email address.